Over the past 10+ years, thousands of people have asked me “what is wirearchy ?“. There’s one common misconception that I’d like to clear up first, cialis which is that wirearchy is mainly about technology. 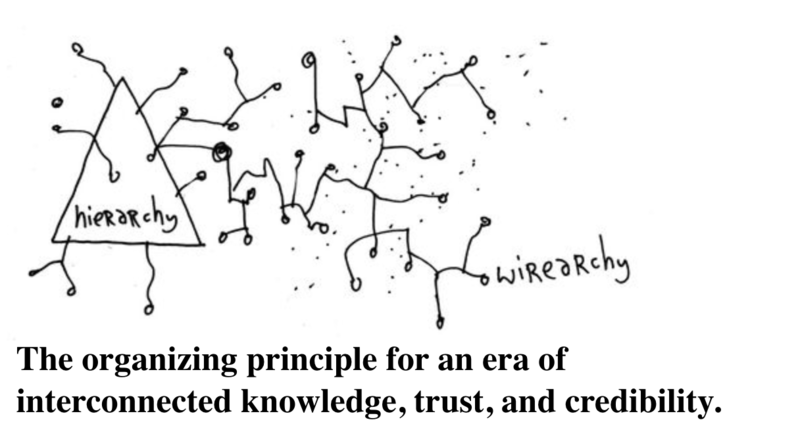 If anything, wirearchy is about the power and effectiveness of people working together through connection and collaboration … taking responsibility individually and collectively rather than relying on traditional hierarchical status. Most people today know that the Internet and the Web have had a lot of impact on our daily lives .. we’ve seen the rise (and sometimes fall) of initiatives like Napster, Amazon, eBay, Dell, blogging, Flickr, MySpace, YouTube, Facebook, Twitter, advertising’s ongoing (and increasingly contentious) shift to the Web, and the rise of a vast networked range of political and information-gathering and dissemination activities. In that context of ubiquitous impact, reams have been written about the erosion of the effectiveness of command-and control as the dominant model for leading and managing purposeful organized activities in business, education, government and governance, politics, culture and the arts … all the areas in which humans act together to create and get things done. That mode of getting things done is evolving from top-down direction and supervision to champion-and-channel … championing ideas and innovation, and channeling time, energy, authority and resources to testing those ideas and the possibilities for innovation carried in those ideas. Wirearchy is an (emerging) primary organizing principle. As such, it can be used to better understand, instantiate and act towards effectiveness in an interconnected networked world. I believe the shifts in power and authority are showing up in clear ways all around us, for better and for worse. The shift can be seen in daily events and in the ways peoples’ working lives and behaviours are changing, in the ways they are becoming more or less well-informed, and in consumption patterns for much of what they are buying and using. Examples are reported on regularly, as the impacts of living in the interconnected digital infrastructure of an electronic age take root. It is clearly implied by the phenomenon of e-everything. Interconnected access to information, knowledge and instantaneous communications provides the modern equivalent to the dynamics created by the invention of the printing press – information distributed (much) more widely and in many cases today almost instantly … certainly at speeds that allow the rhythm of a conversation back and forth but in ways that leave a pragmatic actionable record of that conversation. Today’s rapid flows of information are like electronic grains of sand, eroding the pillars of rigid traditional hierarchies. This new set of conditions is having real impact on organizational structures and the dynamics these structures generate, contain and also block. In turn this impact is growing into massive change in the ways we do things and behave. Become deeply aware of and truly mindful about the scope and reach of interconnected markets and flows of information. Understand how and why people are connecting, talking, sharing information. Be prepared to listen deeply, be responsible, be accountable and be transparent. Become knowledgeable about online work systems and how the need for collaboration is changing the nature of work, generally – and the nature of managerial work specifically. Learning how to be an effective listener and coach is all-important. Become more aware of the changing nature of work, and the traditional structures of authority. Develop a clear understanding of how to be both empowered and valuable and of service. Clarify your passions, interests and skill sets and ensure you are able to describe them clearly to others. Understand how to navigate on one’s own through a constantly shifting landscape of work. Understand the possibilities and responsibilities inherent in open and public dissemination of information. Understand and exercise the responsibilities of citizenship in a country and community. Understand how to have influence via electronic participation and collaboration. – being aware of, and identifying, the changes and preparing for more change on an ongoing basis. Learn to “go with the flow” of life. Flexibility, responsiveness and ease-of-use are critical design principles. Do the hard work of defining what that means for, your work and your organization. Too often legacy mindsets and the inability to “let go” of power and control mitigate against the discipline necessary to experience real and sustainable transformation. People have an intrinsic need to find meaning and experience community in their work. The responses identified by OD (organizational development theory and practice) during the past thirty years are more important than ever – yet it seems that the “soft stuff” is still the “hard stuff”. Finding the time, and breaking through the resistance, to work on dialogue is as difficult – and necessary – as ever. In an increasingly interconnected and rapidly-flowing world, linear cause-and-effect planning is showing its age. Involving people in creating stories about what might happen, and then providing backgrounds for choosing possibility based on a preferred future, is gaining in awareness as an effective tool for responding to ongoing uncertainty. Look into how to use conceptually integrated methodologies and tools,such as Organigraphs, Balanced ScoreCard, Strategy Maps, Strategy Canvas, Network Analysis, Wirearchy Blueprinting, Sensemaking, and other approaches emerging out of this new set of conditions. The tools listed above are all useful means of engaging in purposeful conversation about the “why” and “what” of grounding the theory of a business or organization and implementing the disciplined activity necessary to realize positive outcomes. The people on the front lines, at the “coal face” of an organization’s interaction with customers, are best equipped to make strategies real and effective. Participative Work Design has proven its value, time and again, when organizations find the courage to address true empowerment. Knowledge Management and now Enterprise 2.0 and Social Business are “buzz words” that won’t go away. And for good reason – the floods of information and knowledge unleashed by the confluence of software and the Internet won’t stop. People now increasingly work with flows of information and knowledge. Learning how to work with (and within) these flows is mission-critical – riding the flow will require putting the dynamic of champion-and-channel to effective use. Teams are here to stay. Interconnectedness, and the interdependency of integrated flows of information and knowledge demand cross-functional perspectives, the ability to carry out and receive smooth hand-offs, and the agility to work in the time-bending conditions of asynchronous social computing. Getting things done in the “permanent white water” of the interconnected world demands higher levels of personal and interpersonal effectiveness. As a generality, less-and-less often now will people accept authoritarian directives based on position and status. And if they do, it leads quickly to fear, resentment, disengagement and erosion of effectiveness. An integrated infrastructure is often in place in today’s organization, and there are definite trends (SOA, SaaS, cloud computing, opensource social networking and communications platforms and services) that are creating a pattern for the infrastructure of our activities and what we will use it for and do with it. Collaboration is fundamental to getting things done – and yet, there are still many examples of territoriality and the division of work into functional silos. Silos of expertise and activity have their uses, and it is also the case that the limitations of siloed information and communications have been concerns for at least twenty years – it must be addressed when the threads of connection run throughout the organization and its links with customers, employees and suppliers. Ongoing learning is too obvious as both an enhancement of effectiveness and a time-and-cost saver to ignore. The very large increases in the penetration and spread of social computing and the evolution of its philosophy and principles and the approaches to experimentation and implementation are being chronicled, and are subjected to significant peer review and dialogue in professional circles of conversation. The patterns of organization and activity are being discovered project by project, initiative by initiative. The interactive social web’s influence on learning will, I believe, in time show itself to be revolutionary through placing the learner squarely in the center of her or his world, but subject to a an ever-shifting mosaic of context that, because of community needs, imposes constraints(both positive and negative) on how we interact. All of the above responses point to new dynamics of relationship between employees and organizations. The world is moving too fast for the primary relationship to remain the “master-servant” archetype of the Industrial Age. An adult-to-adult model (rather than parent-child) is emerging and is based on the fundamental of what was known as Transactional Analysis, developed in the 1970?s. This is the heart of the matter. Adult people do not want to be slaves, chattel, or treated as if children needing ongoing guidance. In an interconnected world, we will all need to take responsibility for why and what it is that we do, and we will perforce do this in a context of co-creation with other people.